Eva Poidevin is going places. At just 17, she’s on a fast track to biking stardom. Growing up in an athletic, bike-fanatical family, Eva is certainly showing strong signs of joining Canada’s cycling elite. 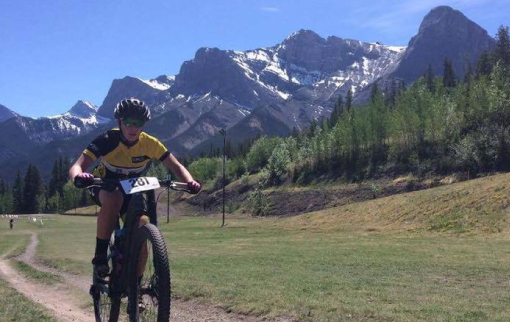 A dedicated member of Rundle Mountain Cycling Club (RMCC) since she was just six years old, Eva has been training hard in mountain and road biking for the past two years, committing to the impressive challenge of taking both to the national level. As part of her go-get-it dedication to her training schedule, Eva recently became an Athlete Squad Member of the Pauw Foundation Youth Sport Fund. 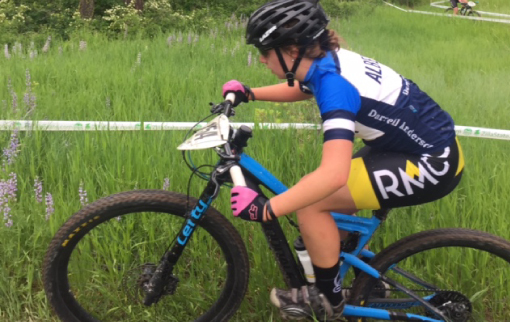 Here, fresh from the 2017 Mountain Bike Nationals held at the Canmore Nordic Centre this past weekend, Eva talks track training, goal-setting, inheriting Dad’s love of biking, and what’s next for her young cycling career. Pauw Foundation: So Eva, let’s start with this: why cycling? 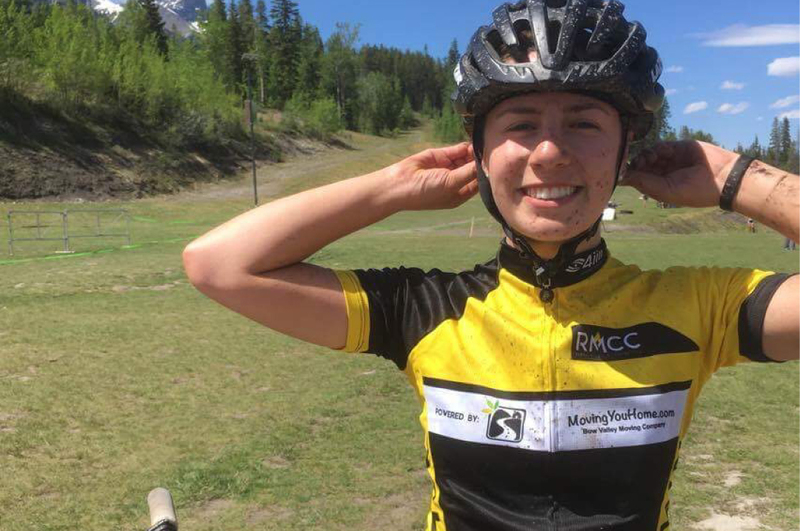 Eva: Well, my Dad was super into it when he moved here [Eva was born and raised in Canmore], and so would get my sister and I out on our bikes all the time [Eva’s older sister is Sara Poidevin, and at age 21, is a Pro Track and Road racer]. When my sister decided that cycling was what she wanted to do full-time, that really inspired me to keep going with my cycling. I saw how cool the sport was, and wanted to be a part of it. PF: And Eva, you train, ride and compete in both road and mountain biking. EP: Yes, that’s right! I love both. PF: And we hear from your Coach [Brittany Webster, from RMCC] that you had three huge goals for 2017, and that you’ve already met all of them?! EP: Yeah! 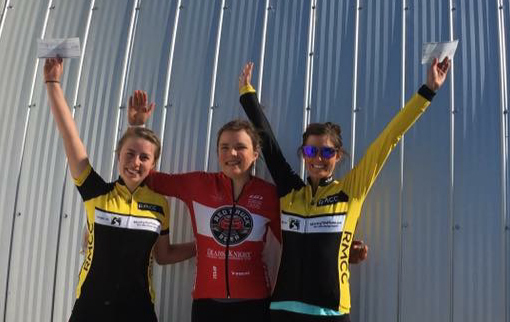 Well firstly, I really wanted to go to Road Nationals, and the Canada Games for both road and mountain, and I’ve been able to qualify for all of those [Eva says with a shy grin]. PF: And for those who don’t know, what does it take to qualify? EP: There are some Alberta Cups that you race at, for points, and from there, Team Alberta will make up a team based on how you finish in those races. PF: And when was it you qualified? EP: The first races took place throughout the month of May, which I took part in to collect points, and then I raced again in June, which is when I qualified – and then the Road Nationals were at the end of June. PF: Great! So, what’s in store for the rest of your summer season? EP: I’m here in Canmore, training and working, and I was just at the Mountain Bike Nationals [Eva finished in 4th place in the Women’s Junior Expert Category at the 2017 Canadian XCO Mountain Bike Championships] – which were right here, it was pretty cool. Then from July 28 to August 13, I’ll be in Winnipeg for the Canada Games, which I’m really looking forward to. PF: So this is a big question Eva, but what’s the ultimate dream for you? EP: That is a big question! I don’t have a specific end goal, I just want to keep riding and see where it takes me. PF: Talk to us about your involvement with RMCC, outside of your own riding and membership with the club. EP: Well I’ve been taking the summer camps since I was really young; growing up taking the camps every year. Then, RMCC started to extend the race program and so I jumped at the chance to get involved! I think I was aged around fourteen then. Now, I’m still in the Club and two summers ago, I volunteered for the first time as a Coach of the Summer Camp – that was really fun. PF: You seem to really like coaching Eva! EP: I do! I’ve volunteered as a coach for two summers now, and it’s really awesome. I was part of those camps when I was little, so it’s great to now be helping with the younger riders coming up through the Club, just as I did. PF: Why do you think it’s important to help and encourage younger cyclists? EP: I think it’s really cool that they see from a young age, that if they stick to it, and it’s something they want to do, they can follow their dreams and get really far in cycling. Being happy on your bike and riding faster is just so fun. I know how that feels from when I was in the camps, and now I get to see that in the young riders. PF: Well, they must all look up to you! EP: I just try and help wherever I can [Eva blushes, with a modest smile]. PF: And where do you like to cycle, close to home? EP: There are some awesome trails around Canmore; Montane Traverse is pretty cool, and the Highline Trail, I really like! PF: How did you come across the Pauw Foundation Youth Sport Fund application? EP: My Coach Brittany told me about the Youth Sport Fund program, and with high costs for training and travelling to competitions, every bit of support really helps. My Dad was actually part of the Sponsored Athlete Program of Banff Lodging Co. years ago [this sponsorship effort was the original iteration of the Youth Sport Fund, before the Wim & Nancy Pauw Foundation was established in 2013], and so I was aware of how it worked and the company’s support of athletes here in the Bow Valley. I applied, and was very happy to be accepted for the 2017-18 year. PF: And would you say that part of your cycling successes to date, have been down to your involvement with RMCC, and having a place to regularly ride? EP: I would, yes. It’s amazing – RMCC has been so supportive of everything I’ve done; I’ve grown up in the club. I see that cyclists in Canmore are part of such a tightknit community; everyone supports one another. I’m so grateful I can be a part of it. PF: Eva, can you pinpoint one particular highlight in your cycling so far, or a time you’ve been at your happiest on your bike saddle? EP: There have been many! But probably when I got to go to Road Nationals, as I got to see a lot of people my age who are dedicated to the sport, and it was really inspiring to see so many people there. That was a great experience for me. PF: And what would you say to younger cyclists who might be future athletes of the Pauw Foundation Youth Sport Fund? EP: I would say, appreciate all of the support you get from the community here, which is always incredible for local athletes who want to pursue a sport. Also, keep at it, even if it gets busy sometimes, as it will always be worth it. Eva Poidevin is one of eleven Squad Members of the 2017-18 Pauw Foundation Youth Sport Fund. 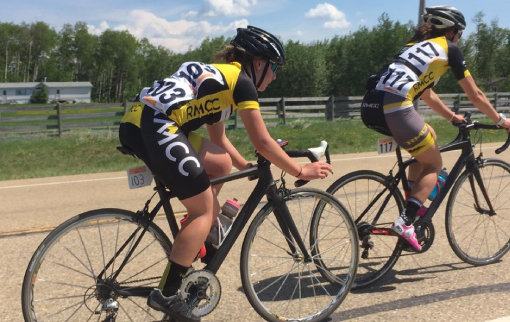 Rundle Mountain Cycling Club (RMCC) is also supported by the Foundation, receiving an annual sponsorship to contribute to their young programs and coaching certification. "Supporting a more active, vibrant, happy community of Banff"